I Components of the decision-making process. 1.1 Effective and timely decisions. 1.2 Data, information and knowledge. 1.3 The role of mathematical models. 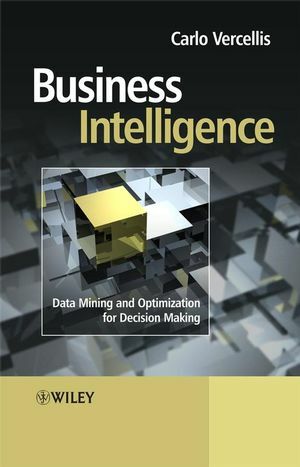 1.5 Ethics and business intelligence. 2.2 Representation of the decision-making process. 2.3 Evolution of information systems. 2.4 Definition of decision support system. 2.5 Development of a decision support system. 3.1 Definition of data warehouse. 3.3 Cubes and multidimensional analysis. II Mathematical models and methods. 4 Mathematical models for decision making. 4.1 Structure of mathematical models. 4.2 Development of a model. 5.1 Definition of data mining. 5.2 Representation of input data. 8.1 Structure of regression models. 8.4 Validation of regression models. 8.5 Selection of predictive variables. 9.1 Definition of time series. 9.2 Evaluating time series models. 9.3 Analysis of the components of time series. 9.6 Combination of predictive models. 10.2 Evaluation of classification models. 11.1 Motivation and structure of association rules. 12.4 Evaluation of clustering models. 14 Logistic and production models. 14.2 Optimization models for logistics planning. 15.4 Identification of good operating practices.